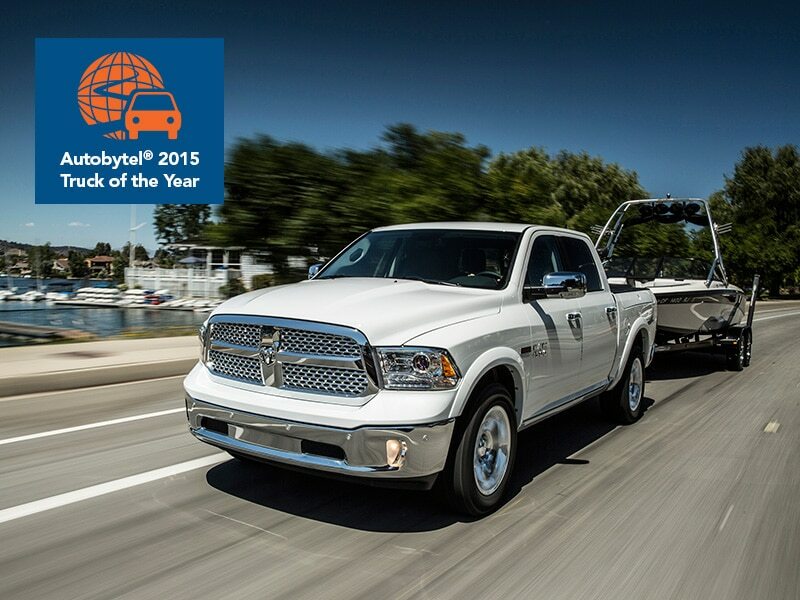 It might seem strange that we don’t have just one pickup truck on our Best Family Cars list for 2015; this year, we have two. That shows not only how far trucks have come, but it’s also our way of acknowledging that families come in many shapes and sizes, and that not every family needs the same thing from their vehicle. 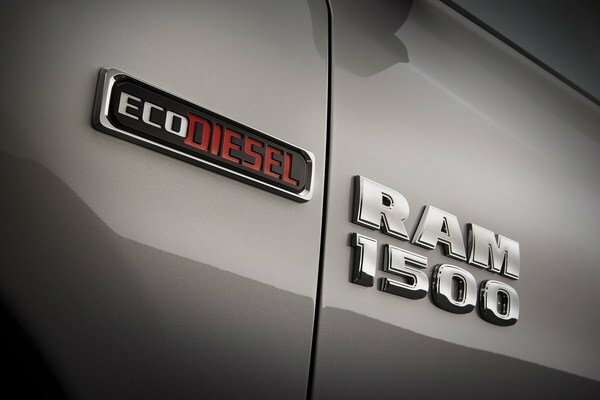 The Ram 1500 may be the most civilized truck on the market today. When it comes to buying a family car, that can go a long way. Many families are looking for more than just a kid carrier, or something that offers easy installation of a car seat. 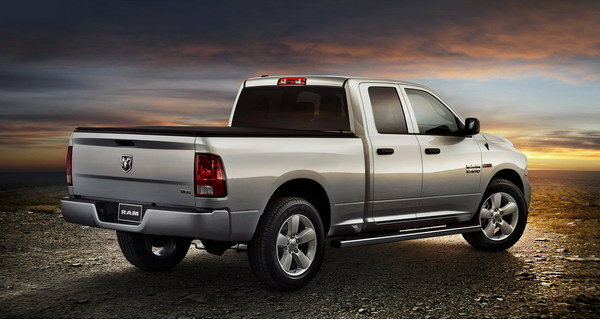 While the Ram can serve as official munchkin mover, it can also do a lot more. Its versatility makes it easy to carry an ATV or dirt bikes, and the Ram-exclusive RamBox allows you to tote small gear on your next camping trip. 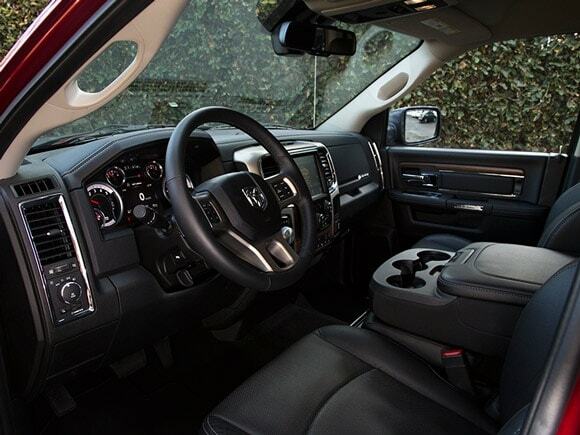 The Ram has the most comfortable ride of any truck. 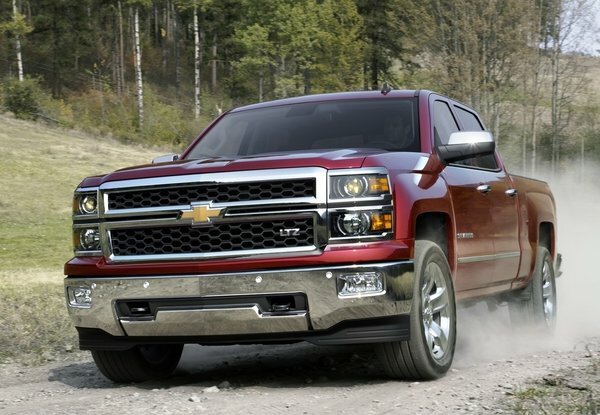 That it can work hard as well makes this an impressive all-around truck, one that can do just about anything. Thanks to a coil-spring rear suspension and available air suspension, a family can enjoy the comfort of a midsize sedan while on a road trip. 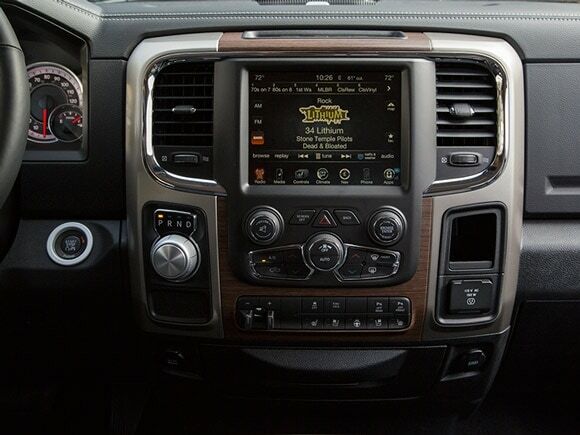 Also adding to that cruising America appeal is the modern interior, with optional amenities like heated leather seats and steering wheel, dual-zone climate control, Uconnect with wi-fi hotspot, nav system and SiriusXM with real-time traffic. There’s also an available clean diesel V6, for a fuel range that ensures you don’t need to stop nearly as often, saving both time and money. The Ram is a truck that’s ideal for the great American road trip, that quintessential event that every family really should do. What better way to see America than in comfort, with all of your adventure gear in tow? Sorry to disappoint you, but all of those rumors about Ram building a Ford F-150 Raptor-fighter turned out to be far from true. This pickup was not built to fight anything. Well, that’s not entirely true, either. It sure beats up on all the other Rams that look more similar than different. This one is obviously a rebel. This 2015 Ram Rebel 1500 might not have the suspension or even engine to combat the Raptor across an open desert. But that doesn’t mean it’s not cool. 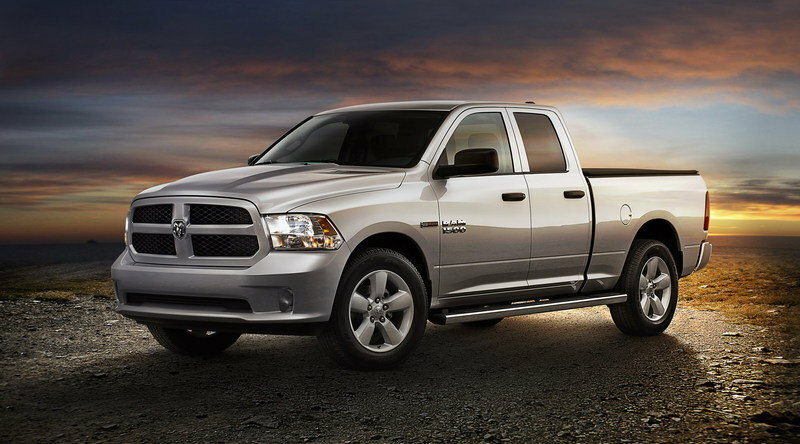 The blacked-out grille instead uses the word Ram across the front and a silver off-road skidplate at the bottom. There are new tow hooks and new foglamps, and even the headlamps have a smoky look to them. There are also two snorkels on the hood, though they don’t provide any function other than give the Rebel the most intimidating 1500 front in the Ram lineup. 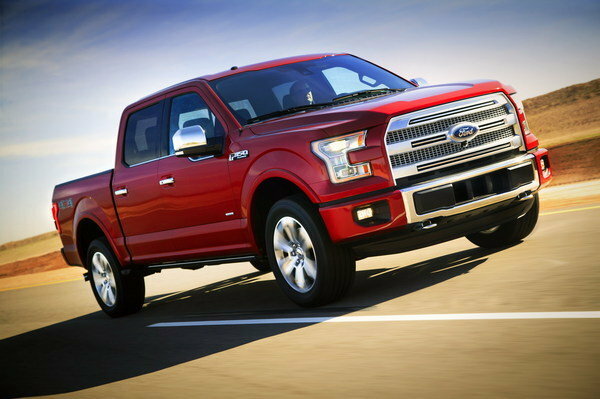 The truck adopts fenders from the Power Wagon and rests on 17-inch wheels with chunky 33-inch Toyo tires. Even the backside is different, using 5-inch letters to spell out Ram across the tailgate. It arrives in five colors, though all of the models with two-tone paint will have a black base. Monotone Rebels are also available. The interior is also done up with a lot of flair. 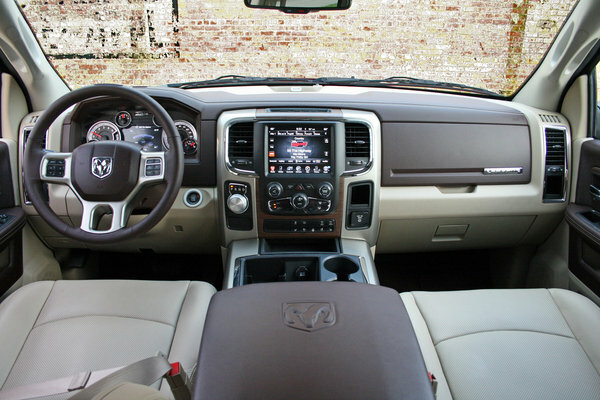 Red trim replaces other trim options found on other Ram pickups. The instrument panel and center stack also have red trim surrounding them. The Rebel will debut a new center console box that features a cellphone/tablet holder, as well. The rubber holder leans the phone slightly but holds it firmly. Really, it’s ingenious. In a quick test, both an iPhone and Android phone, as well as an iPad Mini, fit perfectly, though it is only wide enough to hold two phones at once. 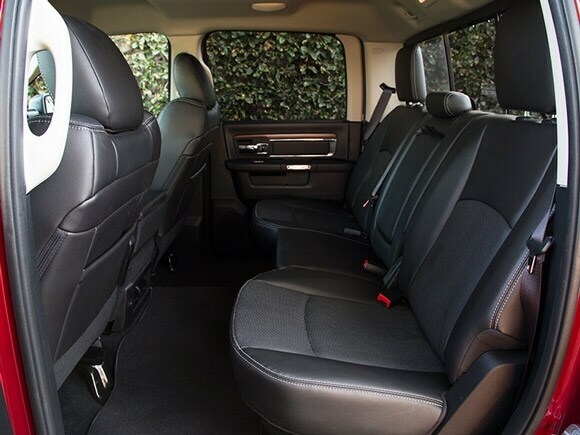 The seats are covered in a Sedoso fabric embossed with the Toyo tire tread, bringing some of the exterior design inside. It looks better in person than any photo might suggest. Although it won’t fly across sand dunes like a Raptor, the Rebel does come with specially tuned Blistein shocks. 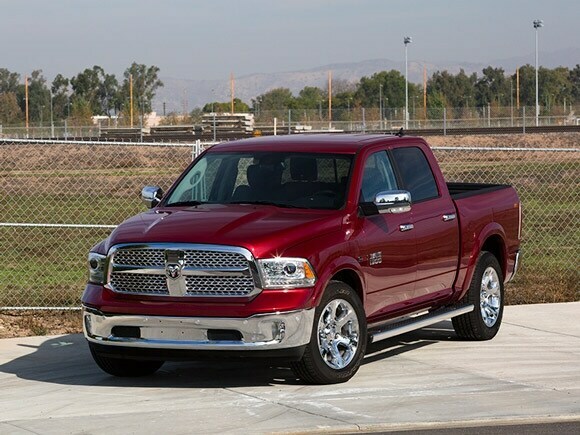 It will also feature the Ram’s air suspension, allowing it to raise itself up 1 inch higher than other Rams. The Rebel will offer two engine choices: the 3.6-liter Pentastar V-6 or the 5.7-liter Hemi V-8. 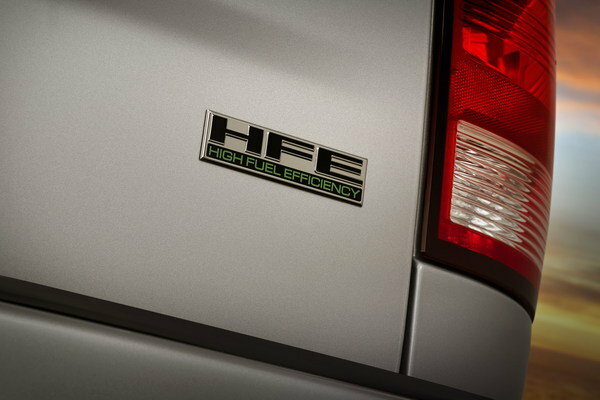 Both engines have a solid track record, the Pentastar producing 305 horsepower and the Hemi creating 395. For the first time ever, the Rebel will feature a 3.6-liter model with a 3.92 axle ratio for 4×4 models. The 4×2 model will have a 3.92 axle ratio. All Rebels will have an eight-speed automatic transmission. Even though the Rebel isn’t a true Raptor-fighter, it still has some serious off-roading chops, considering its power and all of its features. It should also have a much more affordable price, though Ram hasn’t announced that yet. The Rebel should be available by the third quarter of 2015.